Bringing the number of suicide incidents on Metro tracks to three in the past three days, a 55-year-old retired government employee today attempted suicide by jumping in front of a train at south Delhi's INA station. A 27-year-old woman died after falling from the roof of her house in the Lahori Gate area of North Delhi late last night, the police said today. The crime branch of the Delhi police has seized three leopard skins worth more than Rs 9 lakh in the Capital, officials said today. Reacting to the circular on the General Power of Attorney (GPA) issued by the Divisional Commissioner of Revenue, the BJP said that the government should have notified at least six months prior to implementing the Supreme Court's order of banning the sale of property through the GPA in Delhi. Recovering election expenditure from the municipal corporation is the violation of the Delhi Municipal Corporation (MCD) Act. It is the duty of the state government to bear the election expenses, said senior BJP leader Yogender Chandolia. The Faculty of Law, Delhi University, has announced the dates for entrance exams for LLB and LLM courses. The date of form submission is May 31. A 22-year-old man was found shot dead near his residence in the Welcome area of northeast Delhi, the police said on Saturday. With the arrest of three cheats, the South Delhi police has busted a gang involved in several cases of cheating the gullible people by selling them fake gold bricks. A fake gold brick, a Maruti van and a mobile phone used in the crime have been recovered from their possession. He was rushed to the trauma centre at the All India Institute of Medical Sciences where his condition is critical. The man has been identified as Mohan Jagtiani, a resident of Gautam Nagar near Yusuf Sarai. No suicide note was recovered from Jagtiani's possession and the police is yet to ascertain the reason behind his extreme step. Police officials are interrogating Jagtiani's family. The incident took place around 12.11 pm. The train before which Jagtiani jumped was on its way to HUDA City Centre from Jahangirpuri on the yellow line. As it slowed down at the INA station, Jagtiani jumped on the tracks. "He was run over by the train. Though the emergency brakes were applied immediately and the train was brought to a halt, Jagtiani suffered severe head injuries. He was taken off the tracks by Central Industrial Security Force (CISF) personnel," a Delhi Metro Rail Corporation (DMRC) spokesperson said. The spokesperson said the services on the line were affected for about 10 minutes. "The services returned to normal after the track was cleared," the spokesperson added. Additional deputy commissioner of police (Railways) BS Gurjar said, "Jagtiani's condition is critical. We are investigating the incident by analysing the CCTV footage of the station. A case has been registered under Section 174 of the Code of Criminal Procedure (CrPc) at the Qutub Minar (Metro) police station." Jagtyani, who worked as clerk with the tourism ministry, runs a travel agency at Laxmibai Nagar. The incident follows two similar cases reported in the past two days. Yesterday, a woman committed suicide by jumping off an elevated Metro station in west Delhi's Kirti Nagar. Before that, on Thursday, a 28-year-old woman killed herself by jumping off a Metro station in Gurgaon. The deceased has been identified as Farzana. While her in-laws claim that her death was a suicidal act, her family members claim that she was pushed to death by her in-laws, who were torturing her for dowry. On the basis of a complaint lodged by the woman's sister, the police has registered a case of murder and dowry death against the woman's in-laws and husband. A senior police official said, "We received a call around 11:40 pm on Friday, saying that a woman fell from the roof of her house in the Lahori Gate area. She was rushed to a nearby hospital where she was declared brought dead." Farzana was married to Javed one and a half years ago and had a three months old baby. Her sister, Tahira who had come to stay with her in her house informed the police that her in-laws used to torture her for dowry and Farzana had been depressed due to this reason. Her sister said that Farzana's in-laws pushed her down from the roof. On the basis of her complaint, a case of murder and torture for dowry has been registered against Farzana's husband Javed, her mother-in-law Hamida and her father-in-law Gulshed, the officer added. Since it was less than seven years that the couple was married, an SDM enquiry has been initiated into the matter, said a senior police officer. A boxing coach has been arrested in the case. He has been identified as Meetu Singh (22), a native of Balsa village in Himachal Pradesh. He is a graduate and works as boxing coach at a school in the village. He has represented his state in junior boxing championships. Singh was arrested yesterday from the GT Karnal by-pass along with leopard skins. "He is part of a large gang of poachers that specialises in trapping and killing leopards for their skin and fur. 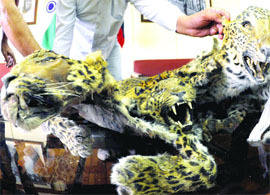 Skins of three leopards have been recovered from his possession. The skins had been well preserved as they fetch a higher price. Each skin is worth around Rs 3 lakh," said Ashok Chand, additional commissioner of police. A case under the Wildlife Act has been registered by the police against the accused. During interrogation Singh revealed that he and his accomplices had been involved in trapping leopards for their skin for over five years now. They usually hunted for leopards in the forests of Shivalik Range in Himachal Pradesh. "They had identified the waterholes frequently visited by the leopards and laid a metal trap in the path. After the leopards were caught, the poachers used to beat the animals to death," Chand said. Singh said that he and his gang has till date hunted more than 10 leopards. They have sold the leopard skins in Shimla, Macleodganj and Dharamshala in HP. In the circular, the Divisional Commissioner had instructed the registrars and sub-registrars not to register any sale agreement on the basis of GPA or will. Chief of the Delhi BJP unit Vijender Gupta said that generally the authorities concerned take six months' time in the conversion of property. The government should have advised the people to get their properties converted from lease hold to free hold so that they may transfer their properties easily. This is an anti-people decision of the government and in this connection a delegation of the BJP will meet the Lt-Governor to apprise him of the difficulties being faced by the people and request him to review the decision, he added. The government has misinterpreted the judgement of the Supreme Court in taking this decision. The government has shown its arbitrariness and lack of sympathy for the people of Delhi. He said that in taking the decision the Division Commissioner had not taken into consideration the loss of revenue to the Delhi government as well as the MCD. It was estimated that the government would lose thousand of crores of rupees due to the ban of sale by the GPA. He has demanded that the implementation of the circular be postponed for at least six months so that the people may be able to get the formalities about the transfer of their property completed before making any transfer. He said that in the municipal election the State Election Commission had spent Rs 33 crore. Of which the government is recovering Rs 13 crore from the MCD account and Rs 20 crore will be recovered from other local bodies as debt. This is in total violations of the provisions of the DMC Act, he said. Besides, every year Rs 5 crore would be taken from these corporations for expenditure by Delhi Election Commission. The act in clear terms had no provision to bear the election expenditure. Chandolia said that holding the elections of the local bodies was the responsibility of the state governments. Therefore, all the expenditure, including salary of the staff worked for the election, should be paid by the Delhi government. Giving reference of Section 7 of the DMC Act, he said that the responsibility of the corporations was only limited to follow the directions of the administrator of Delhi as far as making staff available to the Election Commission for conducting elections. The entrance exam for the LLB is scheduled to be held on June 10 (Sunday) at 10 am and for the LLM on June 17 (Sunday) at 10 am. The deceased has been identified as Nazar Abbas, who lived with his wife and two daughters at Brahmapuri. He had left home around 10 pm last night with two of his friends. However, he did not return home and was also not responding to his family's phone calls. "The body was later found in a pool of blood. Initial investigation has revealed that he was shot in his abdomen," a police official said. The accused have been identified as Harun (26), Unnas Khan (30) and Shahabuddin (53), all residents of Rajasthan. Yesterday, complainant Naveen Daga from Chennai filed a complaint that in December 2008, he had been cheated by one "Pappu" who had sold him fake gold bricks and cheated him out of Rs 14 lakh. Naveen said that in January 2012, he again fell a victim to their ruse. He had received a call from Pappu who invited him to buy another gold brick. He asked Naveen to meet him near Mahipalpur flyover at 9.30 last night. Immediately, the police laid a trap at Mahipalpur Road. As soon as the complainant gave a signal to the police, it acted swiftly and overpowered all the accused. A fake gold brick and two gold samples which were given to the complainant were seized.